Your site has helped me deal with the recent loss of my beloved cat, Lilly. 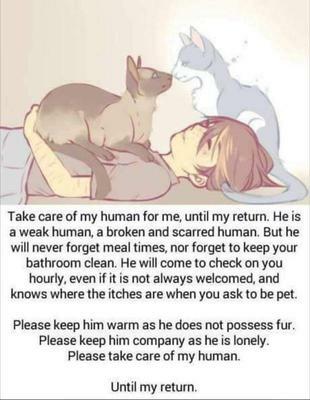 I recently came across this graphic, "Take Care of My Human",that I thought would be appropriate for your site to help others deal with a loss of their cat. Join in and write your own page! It's easy to do. How? Simply click here to return to Happy Cat Testimonials.